They say hindsight is 20/20 or 50/50 (depending on who you ask), so what would you do if you could go back and change those big decisions and wrong turns in your life? 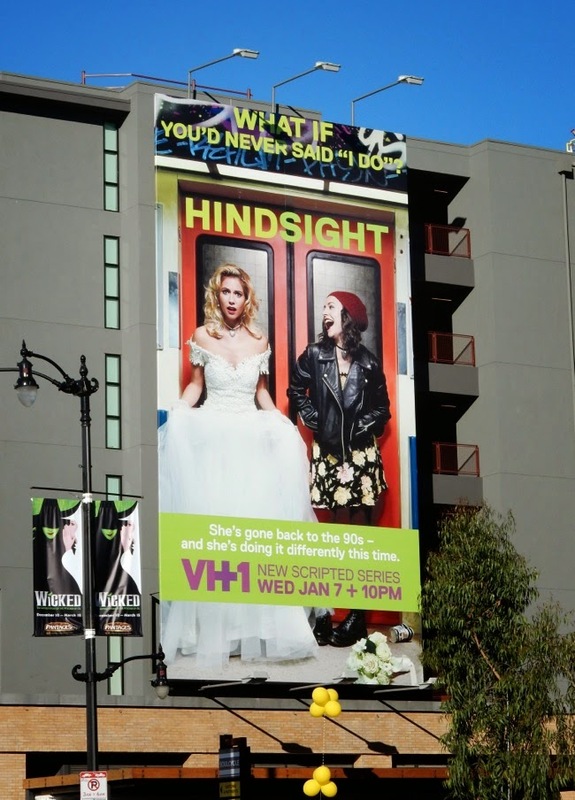 Looks like we're about to find out in VH-1's new scripted series, Hindsight, premiering in January 2015. 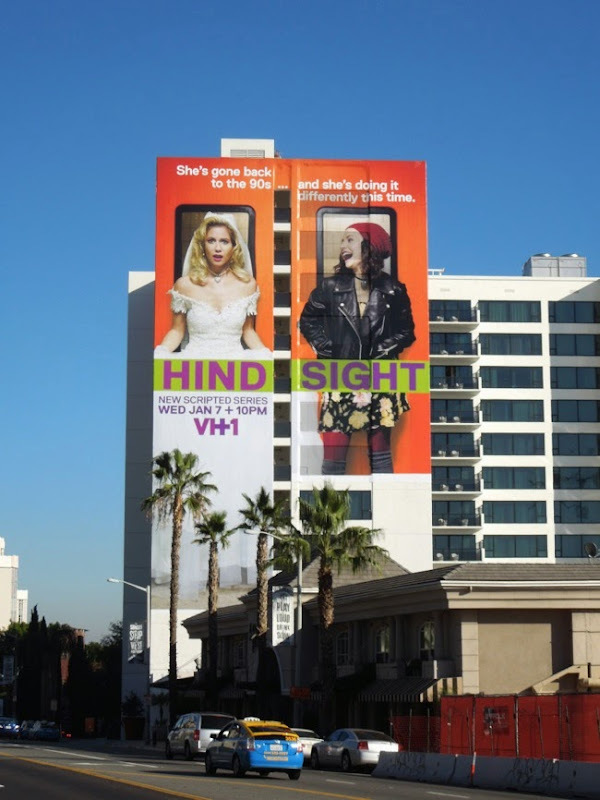 On the eve of her second wedding Laura Ramsey's 'Becca' has the chance to go back to New York City to her first wedding in the 90's and live her life the right way in a world of pagers, floppy disks, smoky bars and AOL email addressees. Or at least that's the theory. This subway carriage creative with the two very different fashion choices evokes the feel of 1998's Sliding Doors romantic comedy, which starred Gwyneth Paltrow and had a parallel timeline premise, answering the question about what might have been. 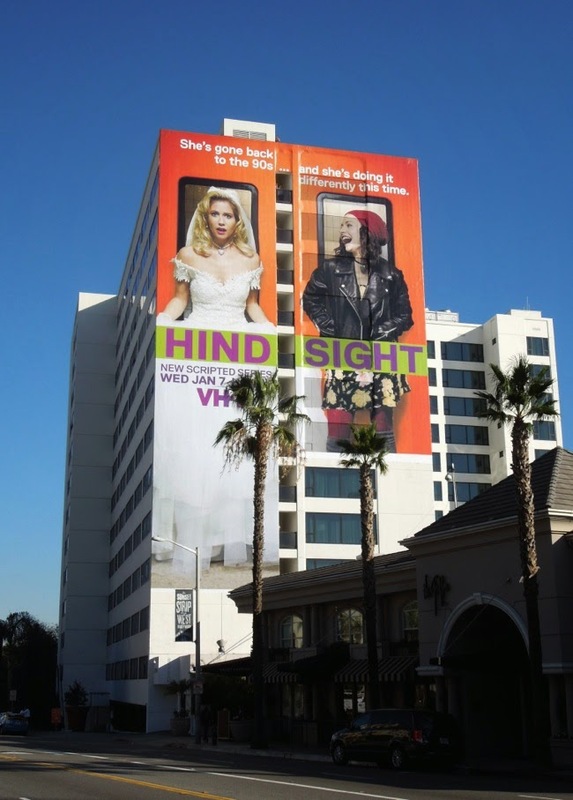 This colourful, eye-catching billboard for VH-1's Hindsight was snapped towering over the constantly evolving Sunset Strip on the side of the Mondrian Hotel in West Hollywood on December 22, 2014. 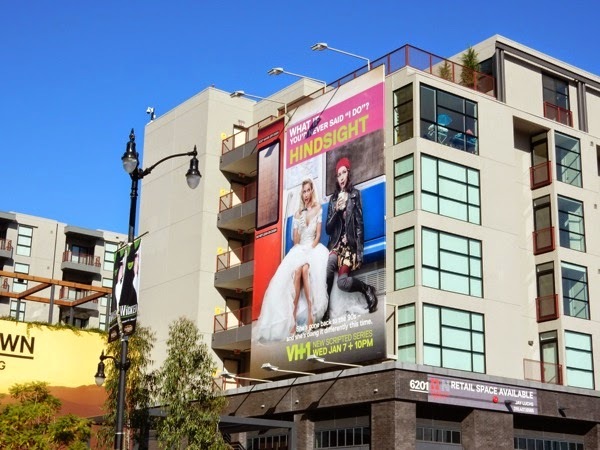 For more billboards featuring wedding dresses, be sure to also check out this Joe's Jeans wedding dress billboard, Bridesmaids movie billboards and these film billboards for The Five-Year Engagement. 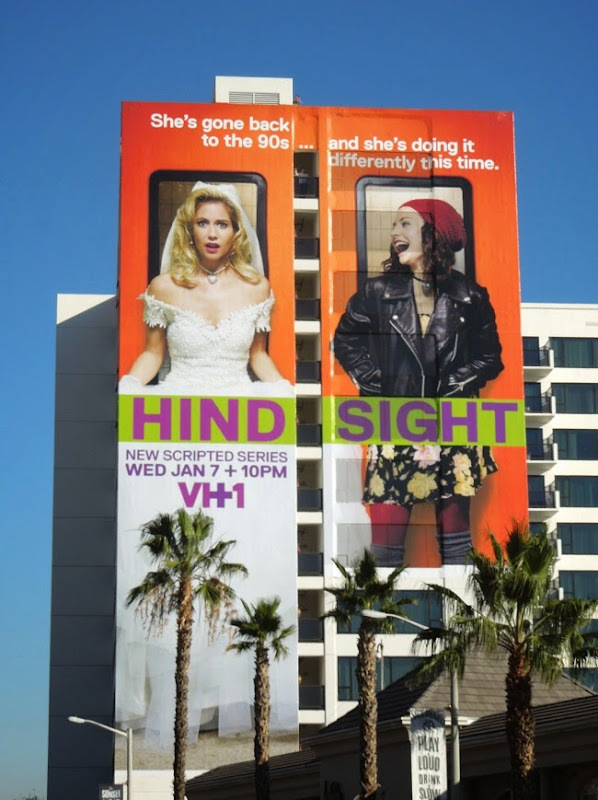 With the likes of Bravo and now VH-1 producing new scripted comedy dramas could this be the death knell of reality TV as we know it? 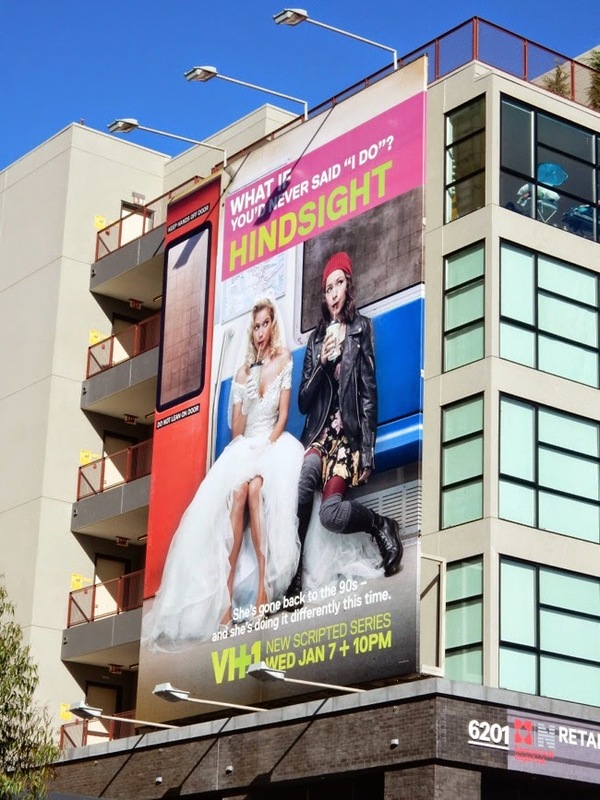 And on this New Year's Eve, what one thing would you take the opportunity to go back and change this past twelve months or in your life as a whole, any regrets? 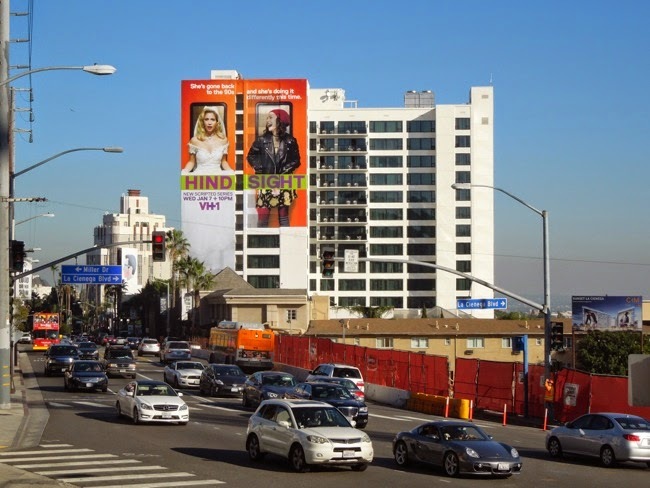 UPDATED: Here's another billboard creative for the new VH-1 show along the same subway theme, this version spied along Hollywood Boulevard at the new Eastown Apartments on January 14, 2015. 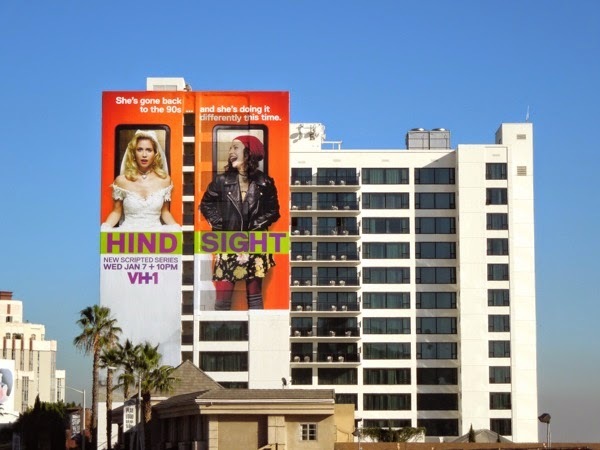 Plus the same creative as the giant-sized wallscape but in a smaller format.